Shibuya may be famed for many things – blaring neon, teen shoppers and busy streets among them. But until now, the buzzy Tokyo district has not generally been associated with quality hotels. Enter Hotel Koé, a new property managed by Japanese fashion retailer Stripe International, that recently opened in a prominent new glass-fronted corner building overlooking a crossing in the heart of Shibuya. Perhaps unsurprisingly given its fashion-conscious location, this is no conventional hotel. Instead, the space – clean-lined and light-filled with an industrial edge, as created by Suppose Design Office – has three levels devoted to eating and music; shopping; and sleeping and art. It’s all about food on the ground floor, home to an open-plan restaurant and bakery with light wood tables, fresh pastries, a DJ-curated soundtrack and good value lunches such as the pink egg and ramen noodles with dim sum. A wide wood and concrete staircase leads to the first floor flagship store, where contemporary Koé clothing – plus Koé-branded lifestyle products by Japanese designers, from umbrella stickers to tote bags – are showcased beneath an exposed industrial ceiling. 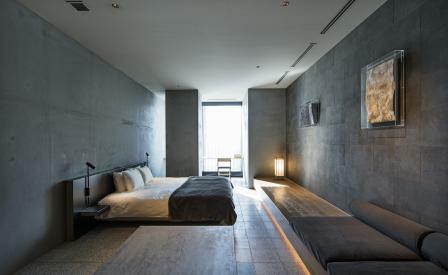 But it’s the sleeping side of the venture – whose branding and art direction was masterminded by Shun Kawakami of artless Inc – that’s most likely to turn heads: accessed via a discreet elevator at the rear of the ground floor, the mood changes instantly the moment the doors open on the second floor. In contrast to the sunlight-flooded lower levels, the space is dramatically darkened by expanses of charcoal grey walls and night sky blue carpets. The lounge immediately envelops visitors in grey, with its muted matt walls and a minimal, clean-lined bar stretching the length of the space. A small VIP space is dominated by two large paintings by Yoshitomo Nara and Hiroshi Sugita looming above midnight blue seating. Each of the ten nearby guestrooms feature a high-tech digital plasma screen artwork by design studio Party New York. And, like Koé clothing, the rooms are divided into four sizes – S, M, L and XL – with clean, monochrome interiors including grey walls, raised bed and glass-walled bathrooms. Sizes vary wildly, with the smallest just 18 sq metres, compared to the luxuriously spacious corner XL room, complete with a tatami mat room, photographic-style artwork by Nerfol, a deep square bath – and, of course, classic Shibuya views onto the streets below.